Akuc Chol is an Apprentice Chef with Neil Perry at Spice Kitchen in Sydney’s CBD. 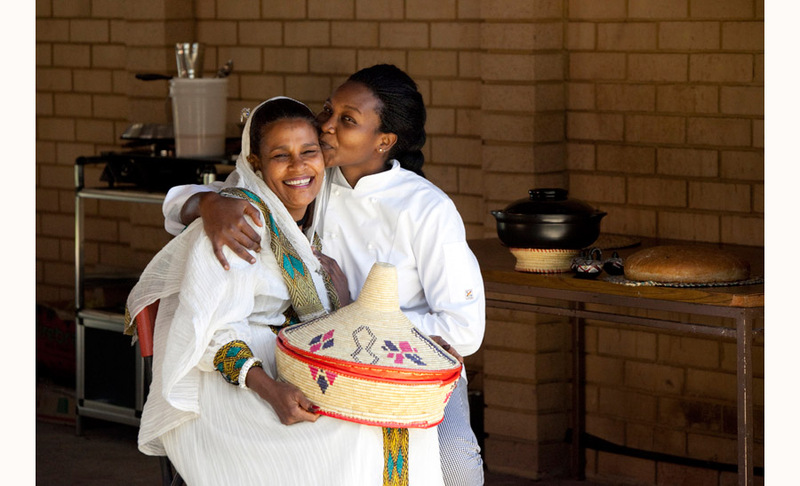 Hewit is Akuc’s mother and is Eritrean, and Akuc has lived in Australia for some 10 years now near Penrith in Sydney’s outer west. When she was just 10 years old she was cooking for up to 20 people at a time. Her story, as well as Hewit’s was so inspiring I asked if I could photograph them together for the SMH Shoot the Chef competition. Fortunately the photo was chosen as a finalist and will be exhibited to coincide with the Crave Sydney Food Festival in Sean’s Kitchen restaurant at the Star City Casino. Hewit is a wonderful cook as well by the way (who often cooks here in her garage because of her preference for a coal fire), and is an amazing woman, having raised her 5 children mostly by herself. She and Akuc are immensely proud of each other and on this particular day we all shared in a fantastic meal of “ingera” pancake bread (in the basket), “hanbasha” sweet bread (on the table) and “dora wot” (chilli chicken and lemon-paprika sauce in the hot pot). I was introduced to Akuc and Hewit by Rikki, Akuc’s boyfriend – a “very funny, very colourful man” as Akuc described him, and as you can see here – such a great looking couple too! all my best to them!